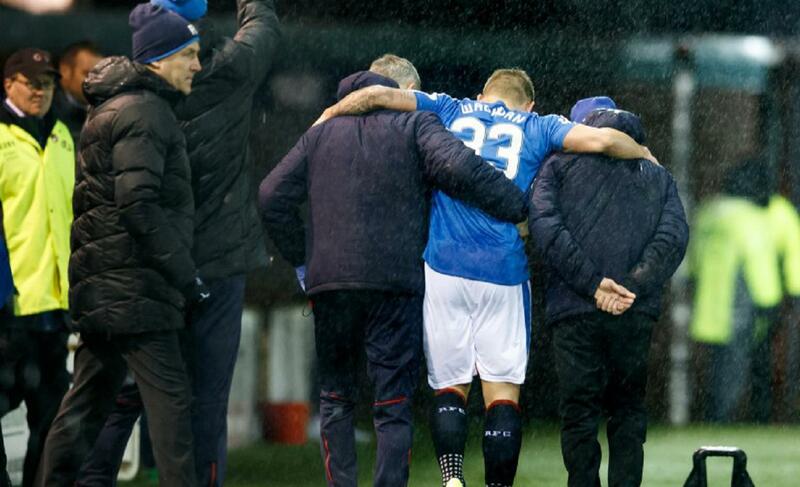 What has Martyn Waghorn’s absence meant to Rangers attack? When Martyn Waghorn went down to injury last month, Rangers were not only losing their top forward – they were losing a player who had played a direct role in nearly half of the team’s total goals in league play. If you factored in goals, primary assists & secondary assists (the pass that sets up the primary assist), Waghorn had contributed to 48% of Rangers’ goals. He had scored a third of the goals & taken 26% of the shots for Rangers. This had the potential to be a catastrophic blow for the club. The void at the heart of Rangers attack seemed to be mighty & it appeared that Mark Warburton would struggle to find the right fit to fill that vacancy. A pair of 1-0 victories over mid-table teams did little to fill the faithful with hope that Rangers could replace the contributions of their top forward. Of course, seven goals in the past two matches – with varied lineups due to cup restrictions – has made many forget that they are missing out on the player who was the dominant goal scorer in the Scottish Championship. So which stretch of games will be the reality going forward? The goal of this post is to see if the ship has indeed been righted & if the two game spike in scoring is sustainable. To do this, I decided to take a snapshot looking at scoring chances in the matches leading up to Waghorn’s injury & then the games following his absence. We’re honing in on scoring chances because there is a much higher probability of scoring when taking shots from High/Very High Danger areas on the pitch. The shots originating from the red, shaded area of the penalty area are considered scoring chances. Twenty percent of kicked shots taken centrally from the top of the goal area to the six yard box have beaten the goalie this season in the Scottish Championship. Shots taken from within the vicinity of the six yard box have resulted in goals 44% of the time. Headed shots are less likely to be scored in these areas but given their location – they will still be counted as scoring chances. Of course, given Rangers approach to playing the ball on the ground they tend to not rely on crosses into the box to create scoring chances. In fact, 81% of their 189 scoring chances this season have been shots with the foot. As a means of comparison, 41% of Hibs’ scoring chances have been headers. The results: Rangers have scored on 23% of their scoring chances…Hibs on 18% of theirs. Headed scoring chances have not proven to be as effective as scoring chances taken by kicked shots. Headers need to be taken within the six yard box to be a real threat. Headed shots from this area score 25% of the time, however 77% of the headed scoring chances are pushed further out in the box & as a result only lead to a goal 8% of the time. So, if anything, these numbers validate Rangers’ deliberate & patient approach to build up play in the final third as they look for ways to create quality scoring chances. Of their goals this season, 68% have been scored in that red, shaded area. Scoring chances have proven to be a much more sustainable route to scoring a high rate of goals. Only six percent of the over 1,500 shots taken from the non-shaded area have resulted in goals this season. Meanwhile, 20% of the 1,150+ scoring chances have beaten Scottish Championship keepers. Back to losing Martyn Waghorn. He had 54 scoring chances prior to his injury, the next two best contributors on Rangers have 49 combined (& that includes the four league matches that have been played since the injury). 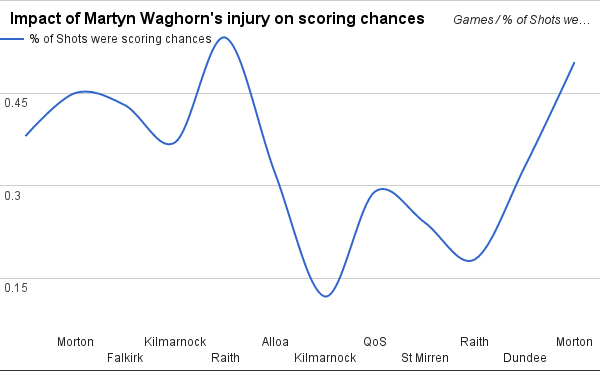 Let’s take a look at the trends in scoring chances leading up to Waghorn’s injury & what has happened since. Waghorn got injured in the initial minutes of the second game with Kilmanock & you can see the immediate impact of his loss. In the five matches prior to that moment, Rangers were routinely generating a high rate of scoring chances. Besides the game against Alloa, Rangers were routinely seeing 40-45% of their shots being scoring chances. They peaked with 54% of their shots being scoring chances in their 1-0 victory over Raith Rovers. Since Waghorn’s injury it has taken a while to return to those results. In the first four full matches since the injury, Rangers had only played one game in which they were able to break the 30% barrier. However, that was the victory over Dundee, in which 33% of their shots were scoring chances. Rangers followed that up this past Friday with 50% of their 16 shots being scoring chances. Rangers clearly hit a lull, but even though it’s only two matches, the results are trending in the right direction. Now, let’s see which players are most likely going to be called upon to lead the way in making up for the absence of Waghorn. Below you’ll find Rangers’ leaders this season in scoring chances per 90 minutes. It’s not a surprise to see the top three are all forwards & Harry Forrester has proven to be a real shooting machine since seeing regular time. The former Brentford midfielder has averaged 5.96 shots per 90 minutes & of those shots, 26% have been scoring chances. It’s probably not likely that Forrester will continue getting six shots a game – but Jason Holt has proven all season long to be one of the team’s most effective players. He averages 0.94 scoring chances per 90 (the highest among regular midfielders this season) & he has been fairly clinical on those chances. He has scored six goals off of his scoring chances (only Waghorn & Kenny Miller have more, with nine each). Of his 20 scoring chances, 30% have beaten the goalie – which is well above the league average. Oooh, you’ve piqued my interest now. Barrie McKay has scored on 40% of his scoring chances? That’s nearly double the team’s success rate. Dean Shiels? Wait, I keep seeing Billy King’s name at the top of this lists? Wait, I can’t find Martyn Waghorn…oh. Wait, what? Let’s add some context to these numbers by aligning them with actual chances created. Below you’ll see the same scoring rates but side-by-side with how many scoring chances each player has created per 90 minutes. 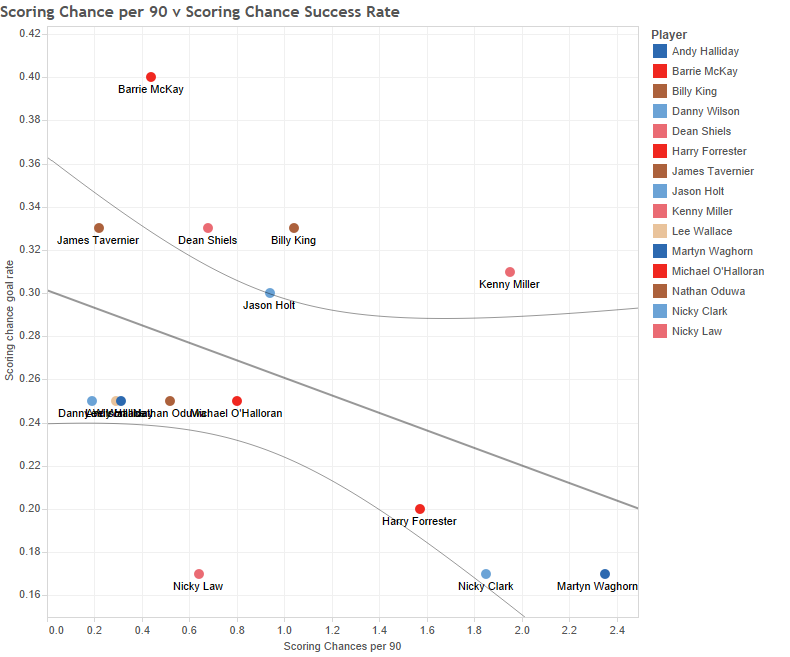 It should be noted that Rob Kiernan, Gedion Zelalem & Dominic Ball (all of whom have scored on 0% of their scoring chances) were not included in the above graph in order to not stretch it out too much. Martyn Waghorn was creating 2.35 scoring chances on average, but was struggling with his accuracy. Of those scoring chances, only 48% were forcing the keeper into a save. The team’s average shot accuracy is 0.529 – so Waghorn’s ability to test the keeper was actually below the team’s average. When his shots were on target, his shooting percentage was 0.346 (which was below the team’s percentage of 0.440). Waghorn was generating tons of scoring chances but, strangely his ability to finish those chances was among the worst on the team. Kenny Miller has the same amount of goals on scoring chances as Waghorn, but on 25 less shots & in 729 less minutes. Even though Kenny Miller is regularly creating scoring chances, it is likely that his results will begin to regress soon. He currently has scored 4.11 more goals then his Expected Goals total, which is the second highest differential in the league. If that does occur, who will pick up the slack? Jason Holt has been a steady contributor all season long, but the statistical promise of Barrie McKay is the most enticing. He has ten scoring chances this season, which is fifth highest on the team. All season long, he has been Rangers most effective player at breaking down the defence & setting up scoring opportunities for his teammates. He has seven primary assists & nine secondary assists this season, which combined, leads the team. Defenders are apt to back off McKay, even in dangerous areas, given that his pace or his pass will likely beat them. If he can find a way to take advantage of this, could he increase his rate of scoring chances? He’s not going to maintain a success rate of 40%, but the opportunity is there for McKay to add, yet another, layer to his play moving forward. Maybe having McKay in the lineup alongside Miller, Michael O’Halloran, & Forrester/Billy King will give McKay even more of a free reign to find space on the pitch as the team seems to have a more fluid attack with this group of players on the pitch – especially when Forrester or King are playing. It also seems like players poised to chip away at some of the scoring chances lost by Waghorn’s absence may be a combination of Billy King & Harry Forrester. The two have combined for eight scoring chances, with two goals off those shots in 546 combined minutes. The subjective view of Dean Shiels’ play this season has been pretty positive, as the fans’ reviews have finally flipped in his favor. Once maligned on a regular basis, Shiels entry into a match is now met with a sense of hope. His play has been very direct this season & the results are beginning to add up. Even though he only has six scoring chances, in just under 800 minutes, he has scored on two of them. 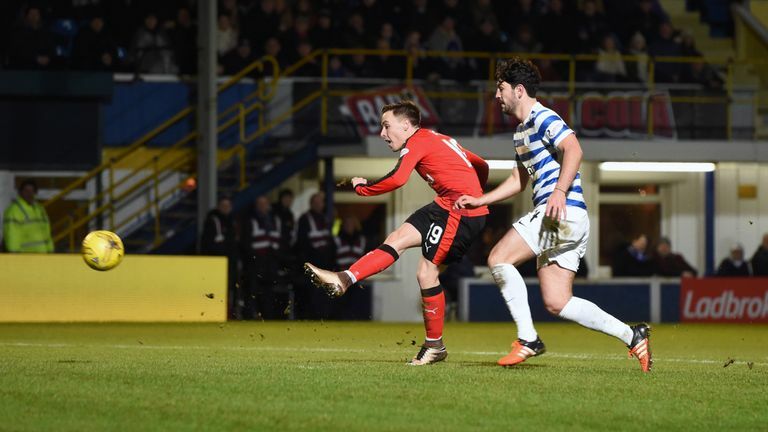 He had four shots on Friday against Morton, half of which were scoring chances. Of course, that means he only had four scoring chances in his 23 previous appearances so maybe Friday was an isolated outburst. What about Michael O’Halloran? The player you could argue was the direct replacement for Waghorn has been both brilliantly dominant & woefully absent in his recent matches. Overall, he has ten shots – 40% of which have been scoring chances. Against St. Mirren, he completely dictated the terms of Rangers gutting out a result. In that game he had 1.4 Expected Assists & 0.26 Expected Goals. His key passes accounted for 55% of the team’s Expected Goals in the game & if you included his shots – he directly played a role in 69% of the Expected Goals. He also got the (actual) assist on Forrester’s last gasp goal that got Rangers the victory. On the flip side, he was most noticeable for being completely absent in his 66 minutes against Morton on Friday night. His one shot was blocked, & unlike the match against St. Mirren he played no role in the build-up of shots. He did not have the primary or secondary pass in the lead up to any of Rangers 16 shots. His lack of synergy with James Tavernier was evident in the fact that only two of Tavernier’s controlled entries into the final third led to a positive results (shot, free kick, throw in, or sustained pressure). Back to the original question that was the entry point to this post: is the recent rebirth of goal scoring in the past two matches sustainable, or will the team return to the dominant, yet less scintillating 1-0 victories? Rangers scored on 50% of their scoring chances against Dundee & on 25% of them against Morton. The finishing against Dundee was sublime & will be difficult to repeat. Rangers need the volume of scoring chances in order to break through at their rate of 23%. In the Morton match, the volume came from Kenny Miller & Dean Shiels – who combined for half of the team’s eight scoring chances. That will likely be the trend – Kenny Miller & someone else. Kenny Miller has been the most reliable variable throughout this stretch without Waghorn, as so much of the offense is now running through him as the focal point. He has a team high 0.92 Expected Assists in the past two matches to go along with his two goals from the game against Morton. Now it will be incumbent on the likes of Harry Forrester & Jason Holt to sustain their support as a second wave of attackers. The volume that Waghorn generated will likely not be matched but if players like Michael O’Halloran & Barrie McKay can increase their number of chances then maybe the team can sustain their recent levels of goal scoring. However, scoring chances will now be more of team effort than a one-man wrecking crew. If the right players can create those increased scoring chances – the team may actually improve…just in time for a certain showdown in mid-April.